Why should I go to XCELSIOR and not my bank for a loan? Unlike the mainstream financial institutions, applying for a loan at XCELSIOR is extremely quick and easy. We do not conduct lengthy credibility assessments, nor do we care whether you’re blacklisted or not. The value of your vehicle simply determines the loan amount you qualify for. We thus don’t take your creditworthiness into account whatsoever. Plus, the whole application process takes less than an hour. No forms to fill in and no fuss. With XCELSIOR it is simply quicker and easier. What documentation does XCELSIOR need for me to apply for a loan? You would only need to bring along your ID/Passport, Drivers Licence and the original registration papers of the vehicle registered in your name. Should the vehicle be in your business name we would also require your company documents, your business registration certificate (BRNC) as well as the identification documents for all directors involved. The application process doesn’t involve any other paperwork. What is the minimum and the maximum loan amounts that I can borrow from XCELSIOR? XCELSIOR will lend from a minimum of R5 000 to a maximum of R500 000. The value of the vehicle you use as security will determine your loan amount. How do I know how much I can qualify for from XCELSIOR? XCELSIOR determines the value of your vehicle and (based on this value) calculates the loan amount. How long does it take until I receive the cash? XCELSIOR prides itself on being fast and efficient. Our loan process, from start to finish, will take approximately 30 minutes. You can have your cash, transferred to the account of your choice, within 30 minutes from application. Does XCELSIOR need to know what I use the money for? No, XCELSIOR handle all transactions professionally and with the utmost discretion. We don’t ask any personal questions. What does XCELSIOR accepts as security? XCELSIOR accepts all types of vehicles as security. You can use a car, truck, bike, boat, bakkie, caravan, and even some motorised sports vehicles, like jet skis as security. All vehicles need to be in a good and drivable condition. Why does XCELSIOR keep my vehicle? As you are entering into a pawn agreement with XCELSIORby using your vehicle as security on your loan,XCELSIOR keeps your vehicle for the term of your loan. Your vehicle is thus stored in a safe and secure storage facility and is fully insured whilst in XCELSIOR’s possession. Once your loan has been settled your vehicle is returned to you, in the exact same condition as what we’ve received it in. Where does XCELSIOR store my vehicle? XCELSIOR stores all vehicles in a secure storage facility, manned by security guards. The storage facility also has electric perimeter fencing, strict access control and 24-hour surveillance cameras. Please click here to view some of the security measures that are permanently in place. Who will drive my car to the secure storage facility and back? In most cases your vehicle will be loaded onto a vehicle trailer and taken to our storage facility thereby reducing the risk of any accidents. In some cases, your vehicle could be driven to the facility. Only a competent driver, with at least five years of driving experience, will transport your vehicle to our secure storage facility and back to the branch where your loan was processed. Does XCELSIOR have insurance for my vehicle while being in its possession? XCELSIOR is insured with a reputable and leading insurance company in South Africa. The insurance covers accident, theft, fire and hail damage. However, XCELSIOR advises clients to maintain their own insurance cover up-to-date and in force for the duration of their loan. Will my car be used by XCELSIOR at any time during the loan period? Your vehicle will never be driven during the course of the loan, except when being transported to and from our storage facility. It safely stays at our storage facility until it is returned to you upon repayment of the loan. What if I cannot settle the loan with XCELSIOR? We always keep a client’s best interests at heart. Should you be unable to repay the full amount due to XCELSIOR, we will extend the contract – providing that the total interest is paid in full on the due date. In the unfortunate event that you are unable to fulfil your part of the contract and settle your loan or just wish to sell your vehicle instead, XCELSIOR will sell your vehicle to recuperate all funds which does not in any way affect your credit ratings. Why can I not pawn and still drive my vehicle? 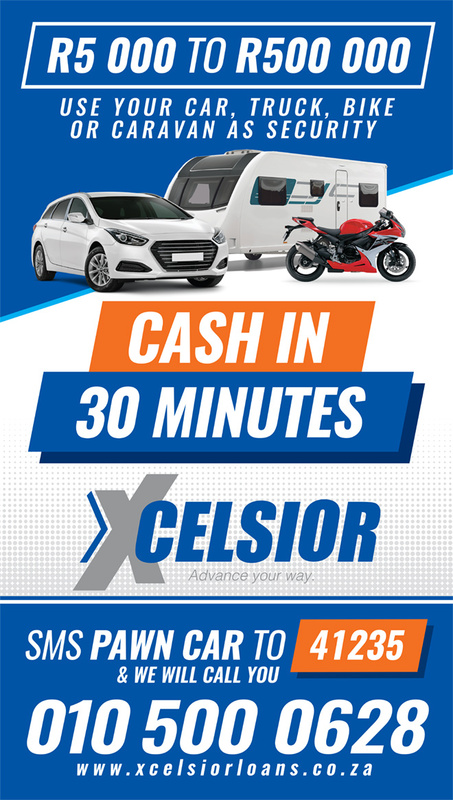 According to recent rulings by the NCR, the Pawn and Drive Scheme has been declared illegal due to the nature of the transaction and therefore XCELSIOR does not offer this type of product.